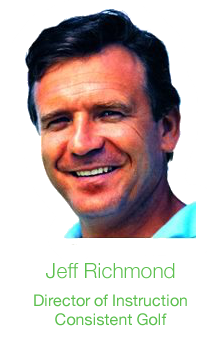 Hello, my name is Jeff Richmond and I’m the director of instruction for the online Consistent Golf School and creator of The Golf Swing Test. I want to congratulate you on taking the 2 minute golf swing test. It was one of the best things you could have done for your golf game. Because these results are going to confirm whether you have one of the worst swing faults in golf…or not! 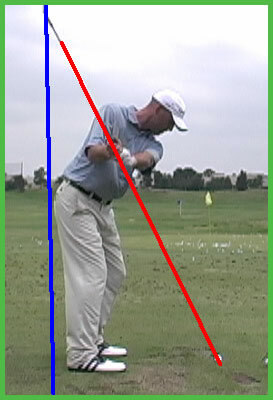 And if you do have this serious swing fault you need to know about it because it will be costing you…. Naturally, all of this makes you score higher than you’d like which affects your enjoyment when playing golf. So make sure you read this entire page right now because if you have this one swing fault it could be the only thing stopping you from really making a big improvement in your golf game. There was one particular place where you should have hit the wall with your 7-iron. 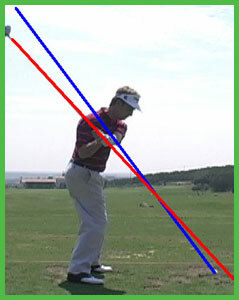 So David Toms clearly has a good backswing plane. Let’s now look at one of the longest hitters that has played on the US PGA Tour at setup and then at the half way point in his backswing. This is with a 6-iron by the way. 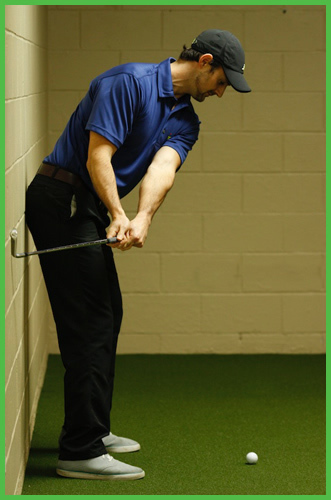 Now when you completed this swing test, if at the half way point in your backswing you were a long way away from the wall like this…. 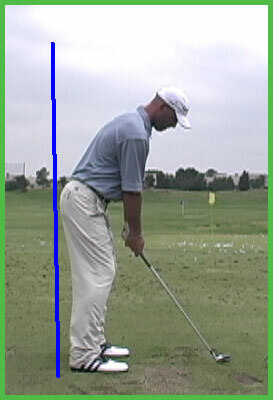 ….then your swing plane is way too upright. Conversely, if you hit the wall well before your left arm was parallel with the ground like this…. 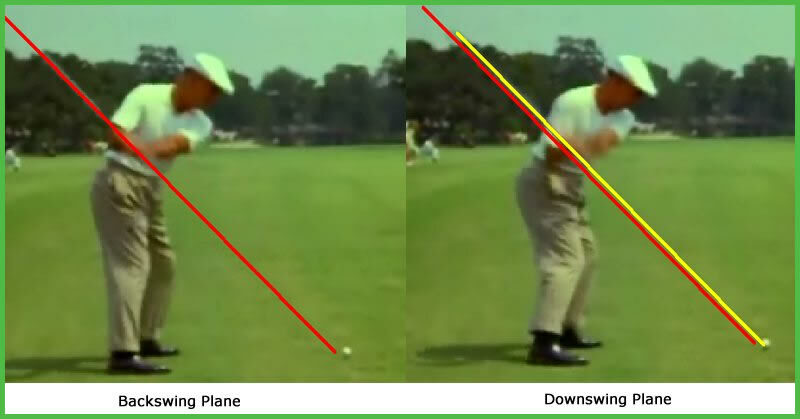 ….then your swing plane is much too flat. 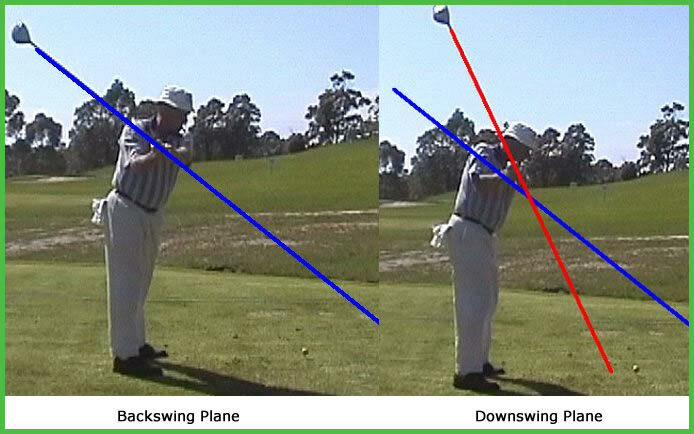 Important Note: Understand this about the golf swing because it’s very important…what happens in the backswing largely determines what happens in the downswing. 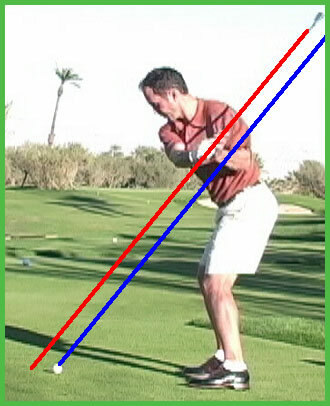 So if you failed the golf swing test this swing fault will be causing you most of your ball striking problems. 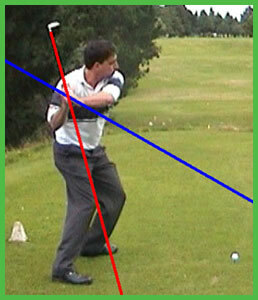 If you do this and you find the line is pointing to the right of the ball then your backswing plane is too flat. This is what most amateur golfers do and it costs them a lot of distance, accuracy and consistency. 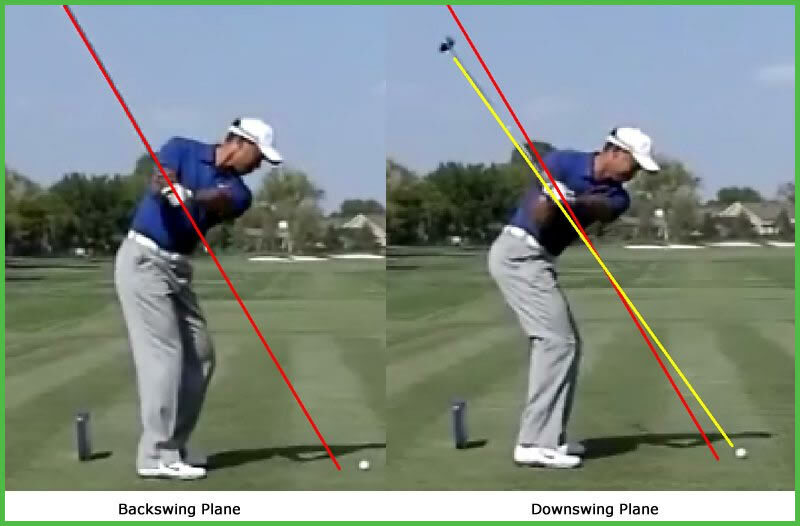 Here are some examples of poor flat backswing planes…. 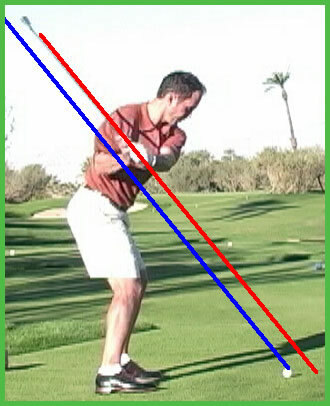 Important Note: The blue lines below represent the backswing plane and the red lines represent the downswing plane. These amateur golfers are demonstrating the REVERSE of what should happen in a good golf swing. Because at the halfway point in the downswing the club shaft should be pointing either at the ball or to the right of the ball. 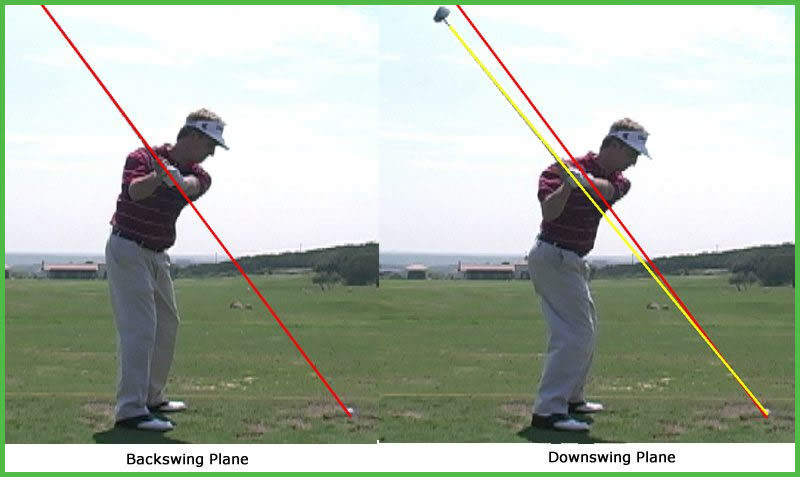 Important Note: The red line below represent the backswing plane and the yellow line represent the downswing plane. 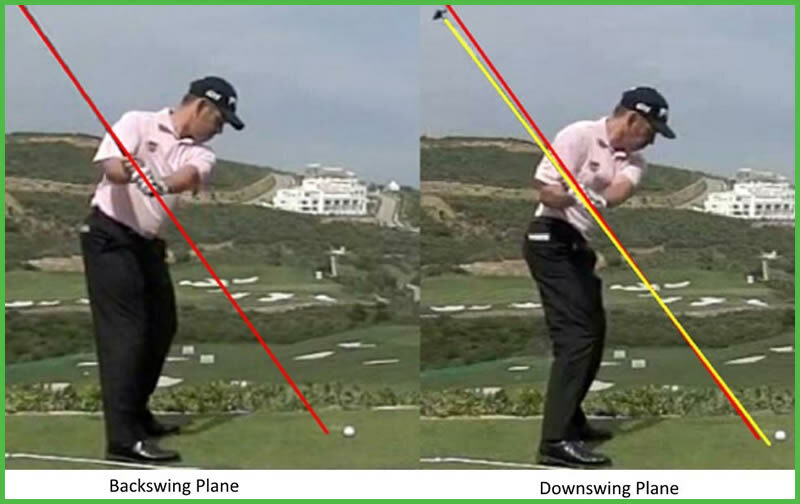 The professionals keep virtually the exact same swing plane on the backswing and downswing, while the swing planes of most amateur golfers are all over the place...to say the least! Don’t believe me? Scroll back up and take a good look at those images one more time...it’s mind-blowing really. 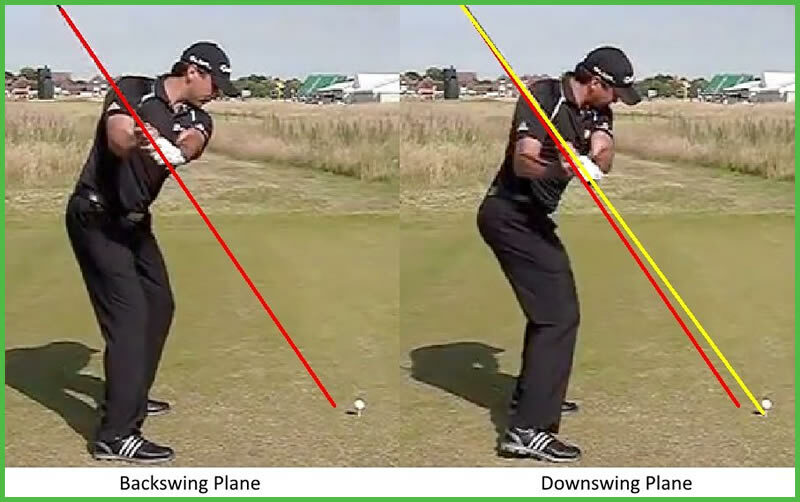 Swing Plane IS the Secret. It’s Why Professional Golfers Run Circles Around Amateur Golfers and Consistently Hit More Crisp, Consistent, Accurate Golf Shots...Even When They Aren’t Playing Their Best! But the real questions is why? 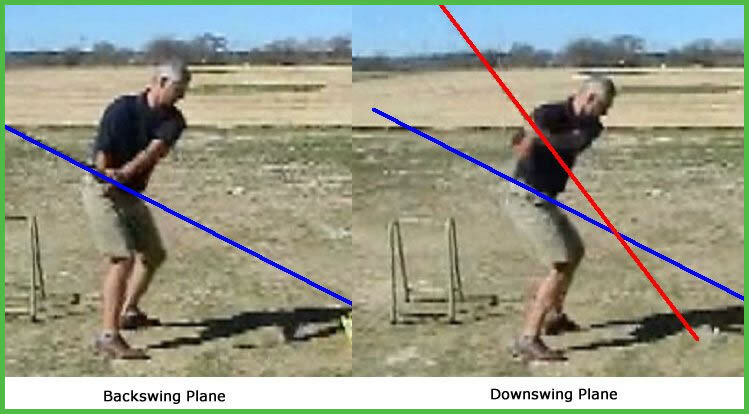 Why are most amateur golfers swing planes the complete opposite of what is correct? 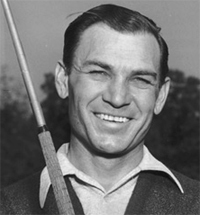 Ben HoganOne of the greatest ball strikers of all time! Reverse every natural instinct you have and do just the opposite of what you are inclined to do and you will probably come very close to having a perfect golf swing. So if you’ve found you’ve got a swing plane problem, to fix this problem you’re going to have to go against what feels natural for you. Let’s face it...fixing your swing plane the traditional way (tons of golf lessons, endless hours on the range, etc.) just isn’t feasible for most amateur golfers. 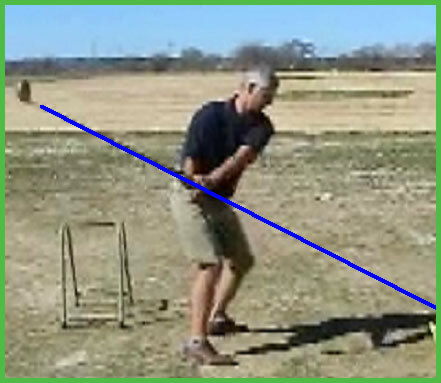 It’s because of these reasons I decided to create an incredibly simple, straightforward plan that golfers of all experience and ability levels could understand and follow to improve their swing plane. Hi Jeff,I filled out the form on your site and did the test like you said. I don’t know how you did it, but your solution to my problem was spot on. 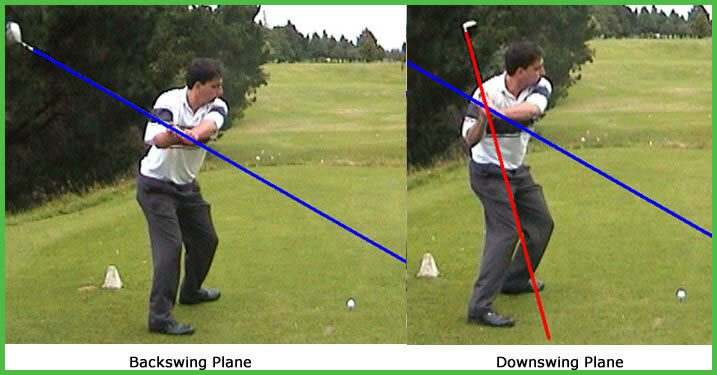 I always used to have trouble with a consistent swing plane. If I wasn’t hooking it off the tee, I was slicing it to the right of the green. Since I purchased your programme and put everything into practise, I’m hitting the ball so much better. I’ve gained distance (especially off the tee) mainly due to the ball going straight for once. As you can imagine, I’m now shooting lower scores, which brings so much more enjoyment to the game. My buddies think I’ve been secretly having coaching lessons and are dying to know how my game’s improved so much. So, let me win a few more beers and I might just let them in on my secret (lol). This is truly worth it’s weight in gold.In short Jeff, this is the best thing I’ve done to help my golf swing, ever. You have really fixed my swing. My new swing feels much easier and more relaxed. Now I’m beginning to swing like a pro. I was motivated to do what I never thought I could with these lessons. I’m a fairly new golfer and normally shoot about 110 but after practicing the steps in the program I shaved off 14 points! Everyone was so impressed with my results and were amazed that I improved so quickly too. Because I failed the test I have definitely been taking these lessons seriously. I went out last weekend and played my first round of golf since getting the program and following it and I really smoked the ball. I am so happy to say I shot an 84. I typically don’t break 100! I now believe that I have the swing and confidence to play in local tournament here. I failed the test and I’d always thought of myself as a fairly decent golfer. So I bought the program and after going through some of your drills it’s a wonder I managed to score at all. My swing plane was way off from the start! Your instructions and drills were explained step-by-step in great detail and were so helpful. I’m so much more consistent now. I shot a 78 which is four strokes below my handicap using my new swing. I actually play better and enjoy the game of golf a lot more now that I see the improvements I’ve made. Hi Jeff, Well I ‘ve been two weeks on your programme and tested myself on the golf course today WOW! For the first time ever I am learning something that is actually working! Hi Jeff, thanks for the follow up. Since I started your How To Fix Your Swing Plane program, I have made some big improvements in my game. Living in Toronto, Canada, I played my last game last weekend and for my last 4 holes I was par. I have never had these positive results in all my golfing years. I started with changing my grip based on your program and it made a huge difference in my driving and my iron play. My chipping around the greens has improved just using the new grip. 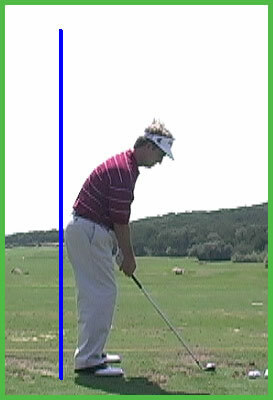 Hi Jeff,I amazed at how much your program has helped my golf. For the last 10 years I have been plagued with a faded and a slice. It has robbed me of both distance and direction. Since adopting some of your easily understood principles my ball striking and square connection have been amazing. I have never been this consistent before. I still hit some shots off line but that’s golf. If I was perfect I would be on the seniors tour! I now step up to the ball with a new found confidence that I am going to hit the ball well. 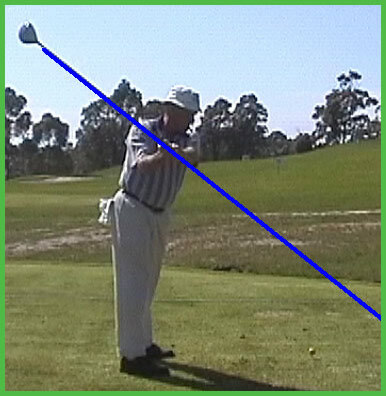 Your teaching has got my swing onto a more upright plane and I find I am not hit the ball fat like I was but have an arch that is more of a sweep motion. Not over the top like it was. I am definitely hit the ball cleaner and more accurately which is helping to lower my score. By now you’ve probably acknowledged your swing plane could use some work...and I’m here to help. After discovering the major swing plane differences between professionals and amateurs, I thought it was time to create a program to help golfers of all levels master their swing plan, and never struggle with ball striking inconsistency again. My simple 3 step program has been designed specifically to teach you in a simple, easy to understand format how to get your swing plane to be a virtual “carbon copy” of the top pros swing planes. Even if you do nothing else and just improve this part of your game you’ll enjoy more consistent ball striking and have a lot more fun (especially taking a few bucks from your buddies!). 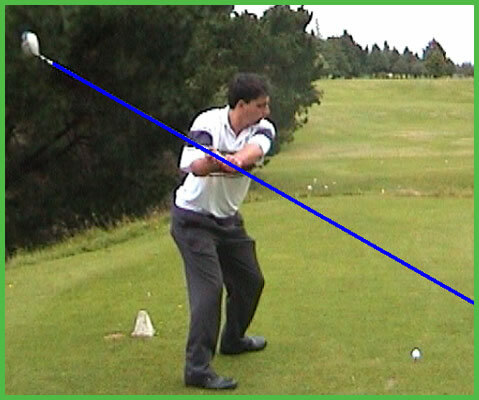 The takeaway sets the state for the entire golf swing, and is essential if you want to swing on plane each and every time. If you struggle with the dreaded "over the top" death move, you'll love page 58. 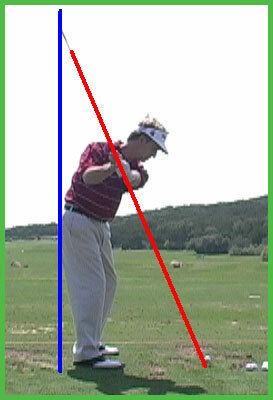 I'm going to give you the best drill in the world to groove a consistent, repeatable back swing plane. During step 3, I'll show you how to get in the perfect position on the downswing to strike the ball with the consistency and force of a professional golfer. In fact, on pages 65-70 I'm going to show you a secret move that I haven't seen revealed anywhere else that will show you how to get into the perfect position on the downswing... Every. Single. Time. You'll also get three drills to help you ingrain this secret move... permanently. After you’ve gone through all the steps, I show you (on page 86) how to “tie it all together” and start hitting consistent, powerful golf shots with your new, perfect swing plane. I’ve also included plenty of pictures that you can always refer back to, which will ensure that you never get stuck. After your buddies get through whacking it out of the trees, it’s your turn to play your approach shot from the middle of the fairway. The shot is a normal 7 iron distance, but you’re hitting it so much better you pull out the 8, and manage to compress the ball nicely and hit a high, solid, penetrating golf shot that settles 10 feet from the hole. By the end of the round, you’ve made more pars and birdies that you ever have before, all because you took a risk-free chance (see below) on improving your swing plane...and it actually worked! 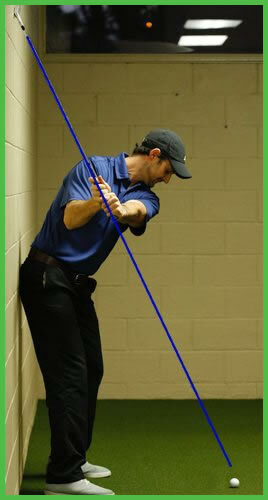 This Could Be You...IF You Fix Your Swing Plane Now! I imagine you want to improve your swing plane as soon as possible.That’s why I have packaged this program up into a digital format for immediate delivery. You can download it now (even if it’s 3 A.M), and there are absolutely no shipping costs! You’re going to get all the instructions, drills, pictures and videos to check that you’re doing each step correctly. At the end of each step of the program, I explain exactly how you can check to make sure you’ve successfully finished that step. Once you’ve successfully finished each step, then you simply move onto the next step of the program. You keep repeating this process until you’ve finished all 3 steps of the program -- at which point you WILL be hitting the ball longer, straighter and more consistently than ever before – 100% guaranteed. I honestly believe that if you complete the 3 steps in this program, you WILL be hitting the ball longer, straighter and more consistently than you ever have before. And I believe that so strongly, that I’m going to give you a completely no risk, 100% money-back guarantee. If you are not hitting the ball longer, straighter and more consistently after completing this program... just let me know and I’ll refund 100% of your purchase... anytime within 60 days of your purchase today. That’s right...you have a full 60 days to try my 3 Easy Steps to a Professional Swing Plane System, and if you find that you aren’t hitting the ball longer, straighter, and having more fun on the golf course after completing all 3 steps, all you have to do is tell us you want your money back, and we’ll refund your purchase immediately. 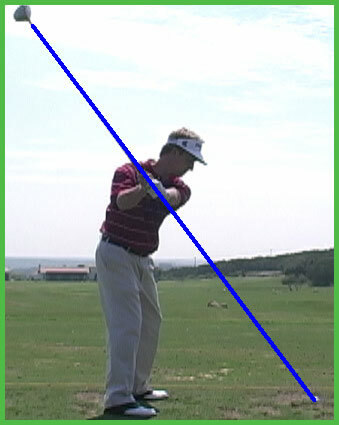 You simply have nothing to lose, and a powerful repeatable golf swing to gain. Now it has taken me months to develop this program...hundreds of hours really. As such, I could easily charge upwards of $200 for this system, and make quite a few sales at that price. In fact, if you were to spend 1-on-1 time with me learning these secrets, it would easily cost you upwards of $1,000 in golf lessons. At that price point, it would still be completely worth it, because improving your swing plane will lower your scores much faster than the latest $500 driver or $300 putter. But you’re not going to pay anywhere near $1,000 for lessons, or $200 for the Easy Swing Plane program. In just a few weeks, I’m probably going to be raising the price of my 3 Easy Steps to a Professional Swing Plane program to $97...maybe even $147. But right now...today...I’m going to give you complete, instant access for only $47. 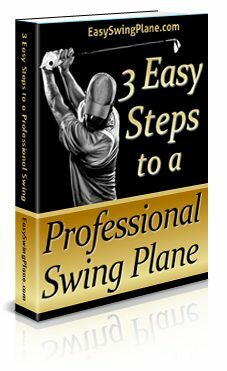 That’s right, you’re going to get my complete 3 Easy Steps to a Professional Swing Plane system for less than the cost of one round of golf at most courses, and certainly less than a single golf lesson! And don’t forget...if you decide this program isn’t for you after completing all 3 easy steps (which I don’t think will happen if you’re serious about improving your swing plane...but just in case), all you have to do is let me know within 60 days and I’ll give you a full refund. Yes! You can now groove a professional swing plane in 3 easy steps for just $47. You’re Probably Wondering... "Why Is This So Cheap?" It’s because I don’t want price to limit the amount of golfers who will enjoy golf more, once they have a professional swing plane. I know how heart breaking it is to try one thing after another, trying to hit consistent golf shots... and then you're left shaking your head because of a lack of ball striking consistency. So I don’t want price to be a barrier to any golfer who is serious about becoming a consistent ball striker. What Are You Waiting For? Don’t You Want to EliminateThese “Stupid” Shots from Your Game? Even when you’re playing well, you still know that bad shot is going to rear its ugly head sooner or later...So get rid of those demons today! 2. You buy your copy of 3 Easy Steps to a Professional Swing Plane program today for $47, groove a swing plane that is exactly like the pros on tour, and start hitting the ball consistently flush while eliminating your big misses...all with an iron clad, money back guarantee. Take action now and get this program. 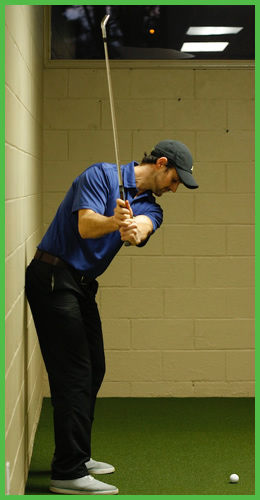 You’ll start improving your swing plane in as little as 10 minutes from now! When you click the ‘Add To Cart’ button now, you’ll be taken to a confirm page where you can pay for this. After Clickbank has processed your payment, then click the ‘Return to Merchant’ link, and you’ll be taken to a very special page, where you can immediately download the 3 Easy Steps To A Professional Swing Plane program. So go ahead…. click the ‘Add to Cart’ button below to place your order and improve your ball-striking permanently. Who knows, you may even pay for the program completely at your next Saturday morning match...if you know what I mean (wink wink!). P.S. Please don’t put off getting this 3 step program now, because we both know how fast 60 days goes by. And when you get this program now you could start today fixing your swing plane within 5 minutes from this very point in time. Then within 60 days you could make a huge, positive difference to your ball striking.